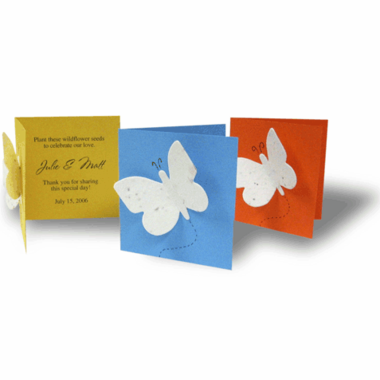 The Butterfly In Flight seeded favor is a dainty card with a seeded paper butterfly on the front. Guests open the card to read your personalized message and instructions inviting them to remove the butterfly and plant in a pot of soil. The butterfly will bloom into a colorful array of wildflowers. When you open the card, the planting instructions are on the left and your personalized message is on the right side.